Yep, you heard correctly! 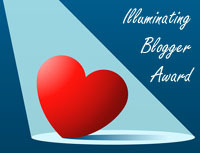 Me, little old me, and my wee little blog received the Illuminating Blogger Award nomination. I can only say that I am BEYOND stoked, simply because it’s amazing to see something that I love so much and have put so much work into, be recognized by others, especially since I have only been live just over a month. I have my loyal readers to thank! To start, I was nominated my Missi, whose blog is Havoc to Heaven. I love her blog! You must check it out. Anywho, I received a message from Ms. Missi (hehe) via twitter (follow me if you haven’t) saying that she nominated me because she really liked my blog! Thank you so much Missi! That means a whole lot:) Also, a big thank you to CJ at Food Stories Blog for creating the Illuminating Blogger Award! So, as part of this process I am encouraged to share something random about myself. Hmmmm, let’s see….there are so many random things, how about I share two! How illuminating are those random things! I know, not the most interesting or controversial things, but they are pretty random. You are welcome Kelly. Love your blog. I dont even think I could stomach a mayo sandwich now! Haha! Thanks Britni. I guess my mom would agree!